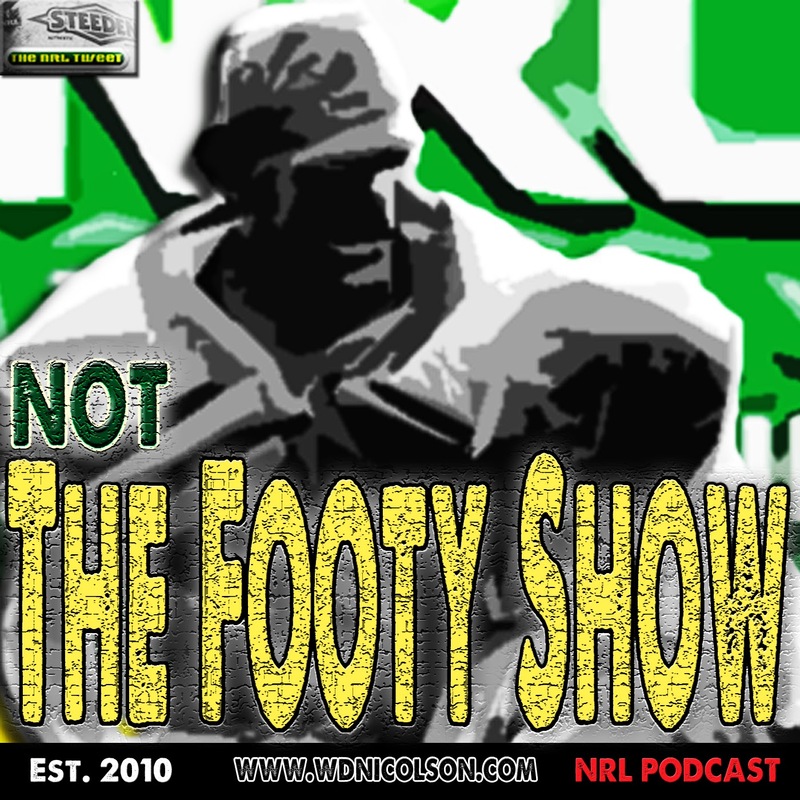 The new season is nearing the halfway mark and The @NRLTweet Player of the Year Awards are heating up in our 5th Season. After 11 Rounds the current Leaderboard has been revealed below and real-time weekly Voting is available on Twitter. So Hayne is our leader through 11 Rounds - and with the bye season underway the leaderboard may be impacted for a few weeks yet as some players get to play extra games while others are on Origin duty. 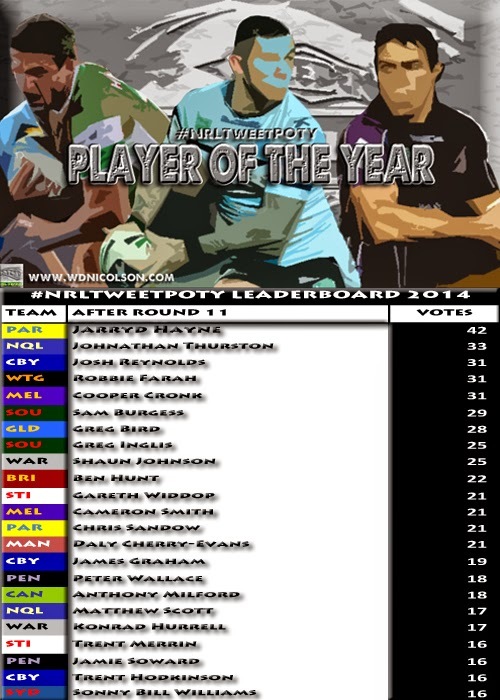 But that's the nature of the NRL beast - so Origin votes do NOT count as part of our NRL Player of the Year Award. Other interesting names in the Top 20 above are Peter Wallace, Jamie Soward and Chris Sandow, while Ben Hunt, Konrad Hurrell and Anthony Milford are letting their talent do the talking. The league-leading Bulldogs have 3 Top 20 reps in Reynolds, Graham and Hodkinson, while Parramatta (Hayne and Sandow), North Queensland (Thurston and Scott), Melbourne (Cronk and Smith), South Sydney (Sam Burgess and Inglis), Warriors (Johnson and Hurrell), St George Illawarra (Widdop and Merrin) and Penrith (Wallace and Soward) all have two representatives each. Cronulla and Newcastle - both at the foot of the NRL ladder are unrepresented. So can Hayne maintain his 9 point lead as Origin takes full toll on the NRL? Cooper Cronk will spend the next 8-12 weeks on the sidelines with a broken arm and may not be able to make up the eventual margin to the leaders when he does return. But other than him, the race for #1 is wide open. The voting is broken down into 2 Voters per game and they vote 4-2-1s for the 3 best players on the field. Ideally each voter goes into each game with no bias towards either team - though voters do get to vote on games involving their own teams but are watched very closely in case they get a little too excited! But that's what makes our system work - 2 voters means you are accountable to the other voter. While it is clearly possible for voters to see games totally differently, if a voter goes for a favourite who did not have a particularly good game - it is painfully obvious and over the years we've been able to weed out voters who may have operated this way in the past - meaning we have as best as possible - a limited-bias factor in our voting. 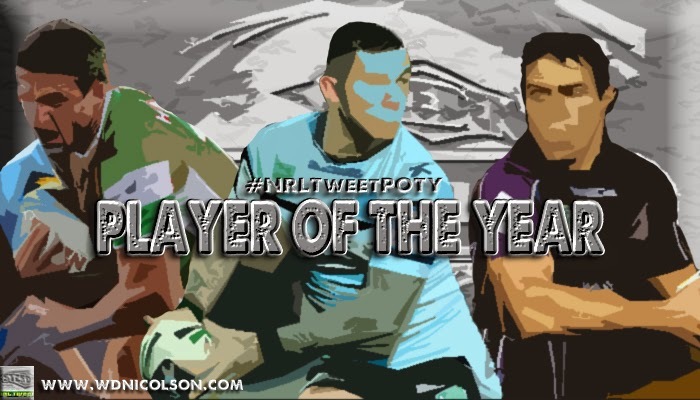 Votes are put up on Twitter either immediately following the live game or by the next morning - so feel free to engage our voters and ask them to elaborate on why they voted as they did - they'll be happy to do it as 140 characters is only enough to literally give our votes and include game hashtags and our #NRLTweetPOTY hashtag.